Wood Poster Frames from SwingFrame Mfg. have an advantage over conventional picture frames, they swing open. That means you don’t have to take it apart to change your posters, graphics or signage. It also means your advertising announcements and other postings can be up and displayed immediately. Wood 361 Poster SwingFrame is a patented poster display frame system designed with hidden hinges and gravity lock – you can’t tell that it swings open – and it stays on the wall when you make your poster and signage changes. Designed with high quality natural wood picture frame moulding, the contemporary 1 3/16” flat top frame profile gives this changeable poster display its picture frame style. Architects, designers, signage and fixture buyers have 10 natural stained finishes and lots of standard poster display frame sizes to choose from. Optional lock with key is available. Wood 361 Poster Display Frames have numerous commercial applications including retail stores, corporations, institutions, hospitality and government agencies – any interior environment that requires a display frame with a simple style and quick-change. • Contemporary Flat Wood Profile - 1 3/16"
SwingFrame Mfg. is a division of Access Display Group, Inc. The company designs, builds and distributes numerous wall mounted poster displays, sign holders and wall display cases, free-standing poster display stands, and other display fixtures for visual merchandising and visual communications. 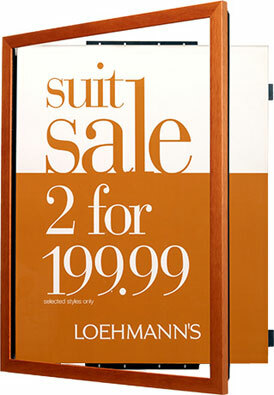 SwingFrame’s patented enclosed poster display system is built to order and customer specifications. These changeable poster displays, graphic holders and sign frames come in small to large format poster display frame sizes and used in all indoor and protected environments including retail stores corporate offices, sports and entertainment centers, hotels and resorts, casinos, retirement and community centers, hospitals and medical centers, banking and credit unions, educational facilities including schools, colleges and universities, libraries, high end restaurants, quick service and fast food restaurants tradeshows and exhibits, museums. airports, government and military facilities —in every industry and marketplace where presenting advertising posters, promotional announcements, products and services, mandatory signage and other printed information needs to be updated and displayed in a quick, efficient, and timely manner. SwingFrame’s uniquely designed quick change Wood 361 poster frames and wooden sign holders offer architects, designers and all fixture buyers a wall poster display frame system to help enhance their interior design signage and graphics with an attractive and functional display frame solution.